There is something that we’ve realized while sub-urban homesteading is that some times there is a ton of work to be done, and sometimes you’ve just got to wait. We have finally found our farmland so we can start the transition from our rented 1/3 of an acre to the wild and wooly 18.38 acres that we will own. Things have been going along pretty well, except the holidays. Now don’t get me wrong, I’m no scrooge but when you are trying to get official guvmint work done so you can get to the fun part, its really difficult to get anything done when everyone is taking every other day off. But, obviously lawyers, clerks, and other city type folk have that luxury. We’ve got a pile of work to do, we just have to wait for everyone else to finish their work before we can start ours. It’s ok, no really it is. Maria and I have been catching up on a few things instead of twiddling our thumbs. 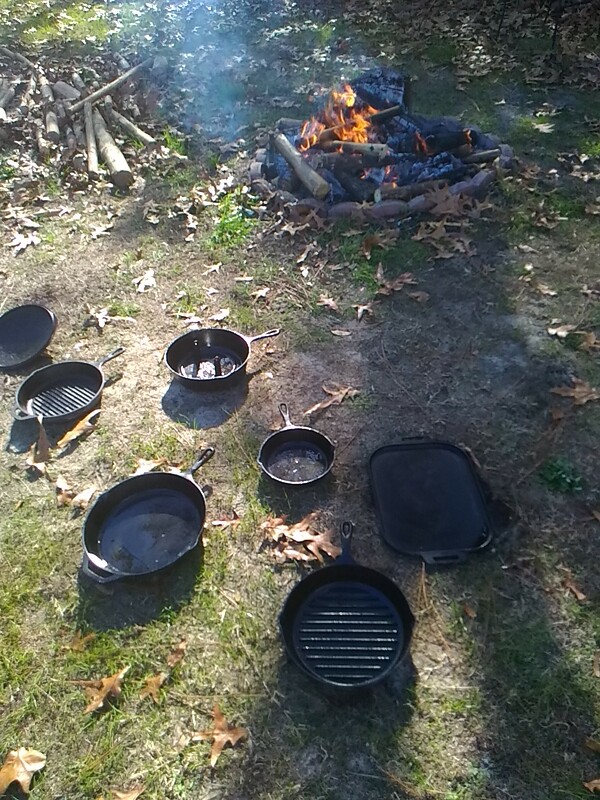 We took some of our older cast iron and a few pieces that we picked up at a flea market and reseasoned them. The older ones we had just needed a little tlc, the flea market jobs needed ALOT of tlc. They are now looking really good. We’ve now got some extras to take and leave at the farm. 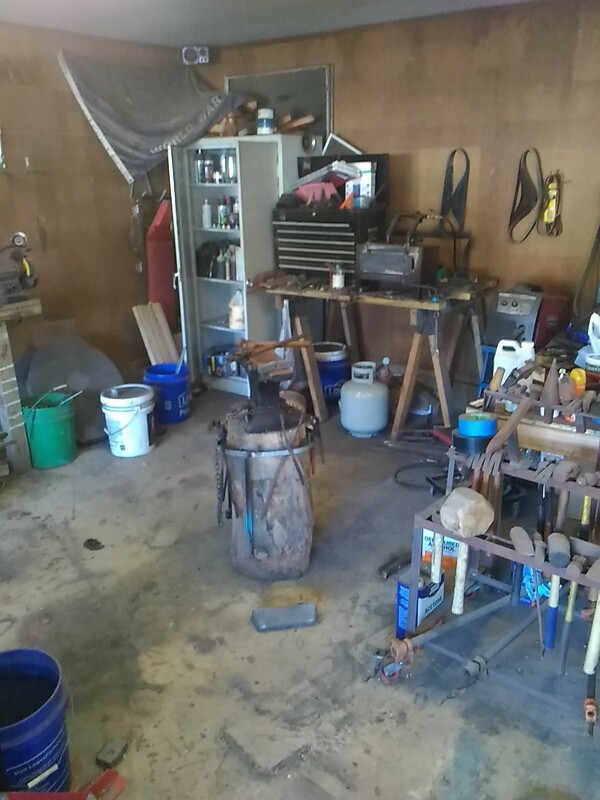 I also did a little, ok a ton, of shop clean up. A blacksmiths shop can get really dirty in a hurry. Now that I’ve got it cleaned up I can get back to making some new items for our Etsy shop. Maria was able to make a whole new batch of tie-dye today to list online. Feel free to come check us out if you like. So, until the attorneys and such can tear themselves away from their parties and revelry to finish the paperwork, we will be prepping tools, sewing, dyeing, smithing……….and waiting. We really do hope everyone had a good Christmas and will have a joyous new year. As we are finishing up taking possession of our new land (YAAAAAYYY!!! FINALLY!) We now are starting to plan and get ready for the adventure to really begin. Our land is 18.38 acres with a small creek cutting across it about 1000 feet from the road. We absolutely love the lay of the land and the water. The only problem….is that it had been logged about 8 years ago. The trees are growing back well, which we love. But, for the first couple of years after the logging, the briars and underbrush have absolutely taken over. Our top two preferences for clearing all of this is 1. a small herd of goats…and 2. a tractor with a bush hog. ecologically sound, and would in turn start to build our livestock…but we won’t be on the property for weeks at a time for a while and we don’t want to leave the little buggers unattended for that long. this option will be a necessity down the road, but after purchasing the land, we are a little tight with funds for a bit, so this one will have to wait. That brings us to the solution we’ve come up with. Maria and I are going to be using two straight shaft weed eaters with metal blades and we are going to just start at the beginning and start clearing. The beginning plan is to cut a driveway from the road to just near the creek…about 1000 feet!..then a clearing where we plan to start building the cabin and barn. Then, every time we are up there to work, we’ll spend a little of the allotted time clearing a little more. This is a huge, daunting job but we have the rest of our lives, and rather than slash/burn, or mow down everything, we would rather selectively clear what we need to and let nature run the rest. We really are shooting for good forest management practices to let the natural trees thrive and to allow us to grow and produce what we need. We hope that everyone has a wonderfully Merry Christmas (or whichever holiday you observe) and a Joyous New Year. In a holding pattern once again…but it’s ok..we are keeping busy. As things start to line up once again for a purchase for out land. We are cautiously optimistic..we love this parcel as we love the last one. But, the other sale fell through so we had to let it go. It really is ok. We’ve got forever to work that land, and waiting another week or two will not make or break us. It’s just the childlike excitement that is driving us crazy! A good bit of Etsy sellers get super busy this time of year. We did last year, but this year hasn’t been much of a holiday rush. This might bother others, but we are ok with it. We’ve been building a decent following over the last year and a half. This has caused us to have some steady (if not bank buster) sales. We are totally fine with that. Our crafts are for enjoyment, utility, and as an artistic outlet. Any money made just helps to forward our cause to eventually Homestead for the Hungry. Once we get started on that land (fingers crossed that it’s this parcel) and we start to really generate some food…we plan on supporting ourselves with our crafts and giving away what we can’t eat.. Anyway, once we get up there and start working we’ll be posting photos and updates as often as we can..if you want to see what we have been up to, come on over to Etsy…there is still time to find great gifts for yourself or loved ones for Christmas.. The farm has found us…. After the very disappointing experience we had 6 month ago with the closing date coming and going for our farm land…we just settled into a routine of working and searching. Things continue to go well with our Etsy shop. Maria has been making some wonderful tie dye items, and my blacksmithing has been gaining popularity. We continued to look and search for that perfect parcel, with most of the searches ending with a just a few minutes of computer work. But, finally….that parcel found us. We have been receiving e-mails with land listings for months with nothing in our price range or well outside the list of details we were looking for. This last Saturday we took a trip to Pittsylvania County Va to look at one. The one that had passed the electronic scrutiny. We realized that this is the one!!! We have started the paper work for 18.38 acres of gently rolling land with a creek crossing the parcel about 1000 feet from the road. It’s a good parcel that will still require a ton of work to get moving along the way we want. It had been logged about 8 years ago. This has good and bad points. The bad is that the trees that are growing back are only about 15-20 feet tall. For the couple of years that it was completely clear the briars pretty much taken over. It took quite a while for us to hack and chop our way from the road side to the creek. We worked up quite a sweat and a fair amount of scratches getting there. The good side to that is that they won’t take much to clear the briars, and we will need to remove some trees. With their small stature it will make it much easier. We then can perform some good forest management to help the existing trees to prosper. Now, we are cautiously optimistic about this. We are excited, yet we are waiting until the deal is done. We thought we had the other one in the bag…and then it slipped away. This one is twice the size of the first..and should make a great farm. We’ll continue to make things and look forward to meeting new, wonderful people on Etsy…and when the deal is done, then the real work begins!! We hope that you all have a wonderful December, and we will be much more active here as things progress. With tons of photos!!! !